It's been a while since I've put up a painting guide... or really much of any posts. I wanted to get this one thrown up quickly with some of the steps. Recently I've had a 'thing' that I've been focusing on with each of my projects. Some of you may recall this being 'airbrushing almost everything' with the Chosen Axes I posted a while back. For these folks - I wanted to mess around with the Hexwraith Flame technical paint from GW. It seemed like a good shortcut to a vibrant and ethereal green. 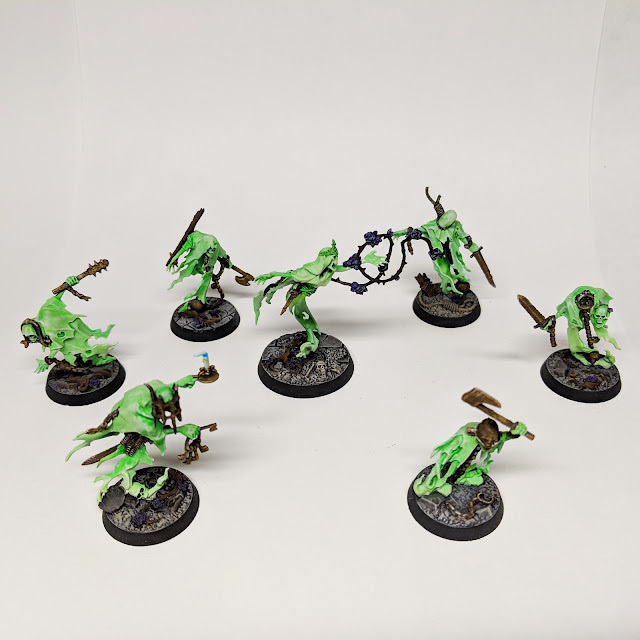 Now I don't often pimp blogs this way with a full on dedicated post but Ulric and I have been working on designing a Learning Unit for a Facebook Group we are in to help guide folks through getting their armies painted up. I think this is a really important skill, those of you that have been following my blog for a while will have seen my own slap-dash approach to this problem as I powered through large volumes of minis last year. Ulrich is way more organized (born product manager). He is also using the excellent Armies, Legions and Hordes book by Dave Taylor for his framework.